Every household now a days has numerous smart phone and tablets and numerous charging accessories. It is time that a universal solution solves the problem. While such a universal solution looks far away in the future, there is a solution in the market right now, which partially solves this problem and is a great product. 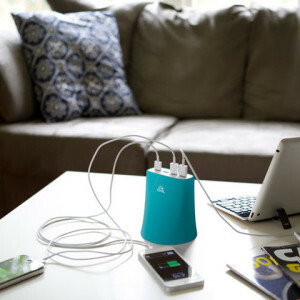 PowerShare Reactor 5.1 is a multi-device charging station for your smartphones and tablets. The PowerShare Reactor multicharger is a 4-port USB device and universal charging station that provides 5.1 Amps of power and surge protection to your iPhone, iPad, smartphones or tablets. With a sleek exterior for your desktop, it succinctly charges your devices and looks great doing it! It is perfect for the family that has multiple devices to charge at this one-stop charging station. What I really like about the CHIL PowerShare Reactor is the small tabletop footprint. The charger has three 1.0 amp ports (each suitable for charging power banks, Kindles, small tablets, and smartphones), and one 2.1 amp port (suitable for charging iPads and large tablets). Thus the ports deliver a total of 5.1 amps. These particular four ports are adequate to keep all of my family’s daily-use mobile devices charged, because we rarely need to charge two devices that require 2.1 amps at the same time. The Chil Powershare Reactor has an ordinary wall-outlet plug (no extra grounding prong–just two prongs, one wide, one narrow). It has a moderately short power cord (about 45″), but the cord can be coiled inside the silicone tower or around the reactor for portability and “cable management”. The packaging materials state that this charger “limits ‘vampire drain’ when inactive”, but give no further details about this presumably energy-saving feature. The charger does NOT have an on/off switch, so it’s always on when plugged in. Overall, it is a pretty good and useful device to declutter and a single solution for all your smartphone and tablet charging needs.